While this artist certainly isn't the same guy as Arthur Freeman, he is perhaps the better known of the two. This is due to Northern soul fans' enthusiasm for the hard driving ""Slippin' Around With You" with Spooner Oldham's hypnotic electric piano. But as ever this track with it's pronounced Motown influences doesn't tell you the whole story of Art's music - far from it. All his other issued sides are far better than that cut - first class southern soul with that fabulous Alabama feel. The other uptempo number Piece Of My Heart has a substantially improved vocal from Art - the gospel influences are much more pronounced - and the flip is a real goodie. 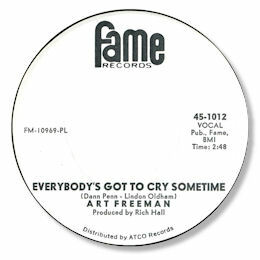 Everybody's Got To Cry Sometime is an excellent waltz time deep soul ballad of considerable force and melodic charm. Spooner is well to the fore again, this time on a Wurlitzer organ, on another of his compositions with the great Dan Penn. We can hope that more tracks from this talented artist appear on CD now that the Fame vaults are open. 1. "Sliipin' around" can be found on the Ace UK CD "Gettin' To Me". 2. It is only fair to say that a number of soul fans believe that the outstanding Arthur Freeman 45 on Jumbo which you can find here was also recorded by this guy rather than the Regal/Astor Arts/Excello artist. I don't think so but as ever am open to persuasion.